February 13, 2015 "ICH" - I have to say that I am both amused and appalled at the completely over-the-top reaction of most commentators to what we might as well call the Mink-2 Agreement (M2A). Apparently, analysis has been abandoned altogether and has now been replaced with hyperbole and vociferous but empty statement. Reading some of the comments made here one could be forgiven for thinking that somehow the war in the Ukraine was over and that the AngloZionist Empire, aided by Putin, Surkov and an anonymous but sinister army of Russian oligarchs, has just inflicted a terrible and final blow to the Novorussian dream. What is going on here? Has everybody just gone crazy? In part, this is due that one could read anything, everything and its opposite into this agreement (more about that later) and also to the fact that the western media simply had to present any agreement as a triumph of western willpower, diplomacy and sanctions. This is all utter nonsense, of course, but that is what you get for exposing yourself to the corporate media. So let's set aside all the loud clamoring and use our brains to actually *think*. First, I would remind everybody that the junta as broken every single agreement it committed to. Every single one. And there is absolutely no reasons at all to believe that this time around this will change. Second, Poroshenko can promise all he wants, but the real power in the "independent Ukraine" is held by Uncle Sam and by the "Maidanites" he controls. Third, why do you think that Merkel and Hollande suddenly felt a powerful urge to "scratch their diplomatic itch" and decided to intervene? Could that sudden urge to negotiate have a little something to do with a place called Debaltsevo? If yes, what does the M2A say about Debaltsevo? Exactly. *Nothing*. Fourth, the agreement not even signed by Poroshenko, but by Kuchma on behalf of the Ukraine. 9. Restoration of full control over the state border of Ukraine by the government throughout the conflict zone, which should begin on the first day after the local elections and be completed after a comprehensive political settlement (local elections in some areas of Donetsk and Lugansk regions on the basis of the Law of Ukraine and constitutional reform) at the end of 2015, subject to paragraph 11 — in consultation and agreement with the representatives of individual areas of Donetsk and Lugansk regions in the framework of the Three-Party Contact Group. Do you see what I see? Nevermind that the border is supposed to get back under Kiev's control only after "something" happens, but check out the "something" itself: constitutional reform in consultation and agreement with Novorussian leaders!!!! Does anybody seriously believe that the Rada will participate in anything even remotely looking like this? Liashko? Farion? Tsiagnibok and Iarosh all working together with the "subhuman colorads" from the Donbass to change the Ukrainian Constitution? Of course not! How is that for a brilliant text? #5: pardons and amnesties. Blanket amnesty for all the war crimes (including MH-17 and Odessa "barbecue"). Disgusting. #6: exchange of "all for all". Except that most folks in the junta hands are long dead. #7: humanitarian assistance. Empty statement, the assistance is already coming in. #8: payment of pensions: the junta does not have the money anyway. Will not happen. #10: Withdrawal of all foreign forces. Nonsense: those who are there (NATO countries) will stay, those who are not there (9000 Russian soldiers) cannot "leave" since they are not there to begin with. #11: Constitutional reform including the creation of "The creation of people’s militia". LOL - apparently, that will be the new name for the Novorussian armed forces. #12: Elections if all of the above happens first. Since it ain't, they won't. #13: Creation of "working groups". Right. Keep dreaming. 6) not even a word about the fact that the Novorussians are not "terrorist" but people seeking national independence. Poroshenko has still not spoken to them directly. It is possible that these issues were, in fact, discussed, but that this will not be revealed to the general public. There might be secret clauses to M2A. However, it is at least as likely that these issues were discussed and that no agreement whatsoever was found, hence they were set aside. a) a stop of the terror attacks by the junta on Novorussian cities. d) money from the IMF (not nearly enough, but better than none). a) the right to control the border until the constitutional reforms are made, in other words ad aeternam. Everybody got what they wanted and left with a smile on their face. Good for them, but none of that does anything to really settle the conflict or even begin to seek a solution. The reality is that nothing at all happened in Minsk, at least nothing of any importance. The Novorussians won the latest battle (yet again) so they came in a position of strength and they got the junta to promise to stop the crazy shelling, and since Debaltsevo was not even mentioned, it looks to me that the junta forces there will be allowed to quietly withdraw as long as they leave their weapons behind. So the Debaltsevo cauldron will be controlled by Novorussia. Putin got political recognition and the hope of at least no more sanctions (remember after Minsk 1 the EU immediately imposed more sanctions on Russia). 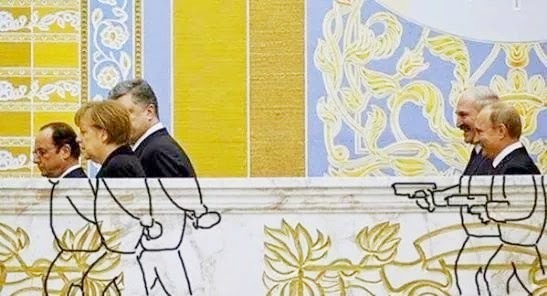 The Europeans got a little something too, mainly some good PR, and the big loser is most definitely Poroshenko who will now have the highly unenviable task of "selling" M2A to a totally crazy Rada (which, by the way, is currently considering an law proposed by Poroshenko's party to make the denial of the Russian aggression against the Ukraine a criminal offense). Just like in a chess game, time is a critical factor. M2A gave everybody a little time-out, but the conflict will resume and the only thing which will stop this conflict will be a double collapse of the Ukrainian economy and armed forces which I believe will most probably happen this summer. Until then, the conflict will be more or less frozen, though I will believe in a junta withdrawal of heavy weapons systems only if/when I see it. Also - remember that one can very well fight with tanks, mortars and infantry. Nazi Baderastan and Novorussia are two civilizationally different project which cannot and will never coexist under one roof. Yes, for tactical reasons there might be the need to pretend that this is possible, but the reality is that it will not. The only way to keep Novorussia inside the Ukraine is to denazify the latter and until that is done, Novorussia will never really return to the Ukraine. That is a hard fact which nobody in the West is willing to accept. In Kiev, they fully understand that, but their "solution" is to empty Novorussia form Novorussians and to give this much needed Lebensraum to the "Ukr" Master Race of western Ukraine. And that is something which Russia will never allow. Which leaves only two possible outcomes: the EU gives up and the Ukraine is denazified, or the US starts a full-scale war against Russia in a desperate attempt to prevent that outcome. In purely military terms the withdrawal of heavy systems is entirely to the Novorussian advantage. Remember that Kiev used these systems to try to terrorize the Novorussian population while the Novorussians used their artillery to try to suppress the junta's artillery. The Novorussians could never use their artillery to attack because they were liberating their own land and did not want to murder their own civilians. So, in other words, if both sides really withdraw their heavy guns the junta will lose a crucial capability while the Novorussians will lose an almost useless one. Okay, that's it for now. I am going to be on the road all day tomorrow, so please take this also as an "open thread" and "see you" all on Saturday, God willing.